What are best practices for using Git source control with Unity 3D, particularly in dealing with the binary nature of Unity 3D projects? Please describe the workflow, what paths would be included in .gitignore, what settings should be set in Unity and/or the project, and any other special things that should be noted. Note: I realize that using the Asset Server is the Unity-recommended way, but I would like to use Git for a variety of reasons. Please no answers that state or argue that I should just use the Asset Server. The Asset Server really isn't an option for me. The following is an excerpt from my personal blog . Update Oct 2015: GitHub has since released a plugin for Git called Git LFS that directly deals with the below problem. You can now easily and efficiently version large binary files! Git can work fine with 3D games out of the box. However the main caveat here is that versioning large (>5 MB) media files can be a problem over the long term as your commit history bloats. We have solved this potential issue in our projects by only versioning the binary asset when it is considered final. Our 3D artists use Dropbox to work on WIP assets, both for the reason above and because it's much faster and simpler (not many artists will actively want to use Git!). I won't go into too much depth here on how the methodology works as the author describes it perfectly and in quite few words too so it's easy to get through. I have been using with my team for awhile now, and it's the best workflow we've tried so far. This is really a personal preference here as there are quite a few options in terms of Git GUI or whether to use a GUI at all. But I would like to suggest the free SourceTree application as it plugs in perfectly with the Git Flow extension. Read the SourceTree tutorial here on implementing the Git Flow methodology in their application. For an up to date version checkout Github maintained Unity.gitignore file without OS specifics. 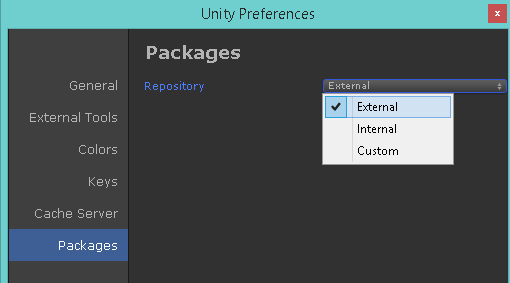 (Skip this step in v4.5 and up) Enable External option in Unity → Preferences → Packages → Repository. 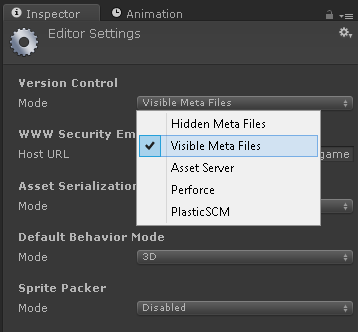 Switch Version Control Mode to Visible Meta Files. Switch Asset Serialization Mode to Force Text. Want you migrate your existing repo to LFS? Check out my blog post for steps on how to do it here. One of the few major annoyances one has with using Git with Unity3D projects is that Git doesn't care about directories and will happily leave empty directories around after removing files from them. Unity3D will make *.meta files for these directories and can cause a bit of a battle between team members when Git commits keep adding and removing these meta files. Add this Git post-merge hook to the /.git/hooks/ folder for repositories with Unity3D projects in them. After any Git pull/merge, it will look at what files have been removed, check if the directory it existed in is empty, and if so delete it. Note that the only folders you need to keep under source control are Assets and ProjectSettings. More information about keeping Unity Project under source control you can find in this post. Git is a free and open source distributed version control system (SCM) developed by Linus Torvalds in 2005 ( Linux OS founder). It is created to control everything rom small to large projects with speed and efficiency. Leading companies like Google, Facebook, Microsoft uses GIT everyday. First of all make sure you have your Git environment set up.You need to set up both your local environment and a Git repository (I prefer Github.com). GitHub is the place to share code with friends, co-workers, classmates, and complete strangers. Over five million people use GitHub to build amazing things together. To add to everything stated, it it also ideal to use git lfs with Unity. I have been using this since it came out and it has had no trouble. That is my rolling file list. If you use additional binary files not lists, add them. The new GitHub for Unity extension brings the GitHub workflow and more to Unity, providing support for large files with Git LFS and file locking. At the time of writing the project is in alpha, but is still usable for personal projects. Set Version Control to meta files. Set Asset Serialization to force text. (A) DO NOT check-in the Library folder. I have made this mistake multiple times in past and have suffered for it! Delete OR move out library folder before adding your project / files into git. (D) Make sure the .gitignore file is added to the repository as the first file added - because in past I personally have missed adding .gitignore file. Have many thoughts in hindsight on why this happened- but nowadays I just copy and add .gitignore file as first step of setting up repository. (2) Type git init . (3) Copy the .gitignore file: On MacOS: cp ~/Downloads/.gitignore On Windows: copy c:\Users[yourusername]\Downloads.gitignore . Hope this helps... all the best! Only the Assets and ProjectSettings folders need to be under git version control. You can make a gitignore like this. I would rather prefer that you use BitBucket, as it is not public and there is an official tutorial by Unity on Bitbucket. You can use Github for Unity, a Unity Extension that brings the git workflow into the UI of Unity. Github for Unity just released version 1.0 of the extension. 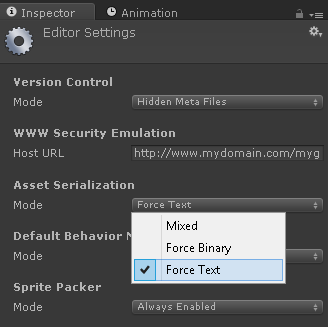 Unity also Provide its own Source version control. before unity5 it was unityAsset Server but now its depreciated. and launch a new SVN control system called unity collaborate.but the main problem using unity and any SVN is committing and merging scene . but Non of svn give us way to solve this kind of conflicts or merge scene . so depend upon you which SVN you are familiar with . I am using SmartSVN tool on Mac . and turtle on windows . Not the answer you're looking for? Browse other questions tagged git unity3d version-control or ask your own question. How to prepare a Unity project for git? Program for getting and uploading latest version of a project? How do I export whole Unity project with all scenes? What does your .gitignore file look like for a Unity project?